Black Friday and Cyber Monday are expected to generate billions of dollars in sales for clothing and other products this year. But this shopping bonanza also generates greater volumes of waste than ever. That is bad news for the environment. Instead of chasing prey in the jungle like our ancestors did, we chase bargain clothing that seems like a good deal. Just look at the scenes that take place every year in American shopping malls on the fourth Friday of November, when people try to secure a favourable position in the queue outside shops in the early hours of the morning. One could say “Black Friday” deserves its name: Every year dozens of people are crushed, even to death, as has happened in the past. Black Friday, followed by Cybermonday, are intended to mark the beginning of the big shopping season, when some people start buying gifts for Christmas. Both days use heavy price discounting and special offers to trigger a sense of urgency and “exceptional opportunity” to consumers, triggering low cost, high volume impulse buying and – as a result – overconsumption of unnecessary goods. Because it is so cheap, fast fashion is one of the highest selling product categories on Black Friday, with many major fashion brands and retail giants jumping on the bandwagon. While it is hard to resist the allure of the next must-have outfit, consumption research shows that the act of shopping only gives us a short burst of excitement, but no lasting reward. 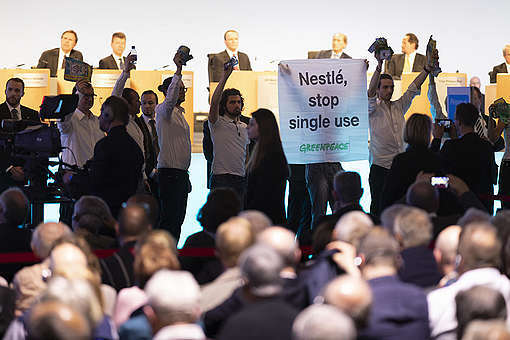 However, the environmental impact lingers and is all too real. Greenpeace has shown that fashion production uses lots of precious fresh water and pollutes rivers and seas with toxic chemicals, long before it hits the shelves. 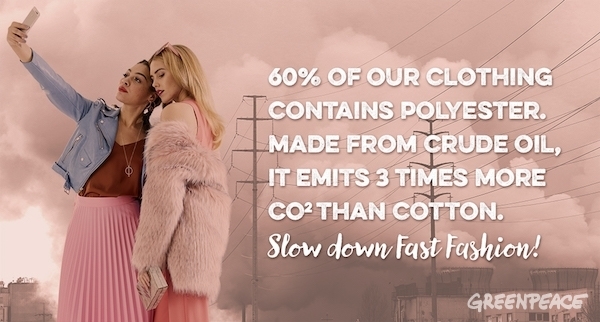 We are also consuming and trashing clothing at a far higher rate than our planet can handle. 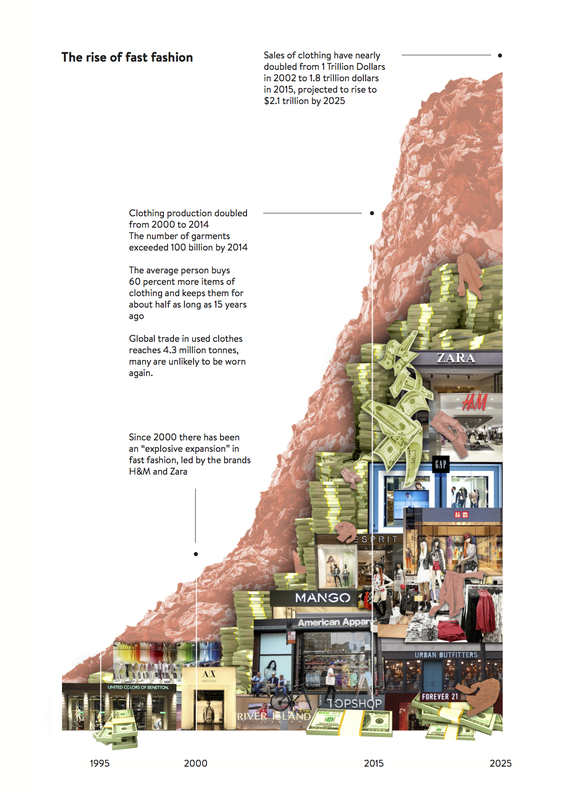 Fashion retailers have been speeding up the turnaround of fashion trends since the 1980’s, increasing the rate that we use and throw away clothes – the life cycle of consumer goods shortened by 50 percent between 1992 and 2002. 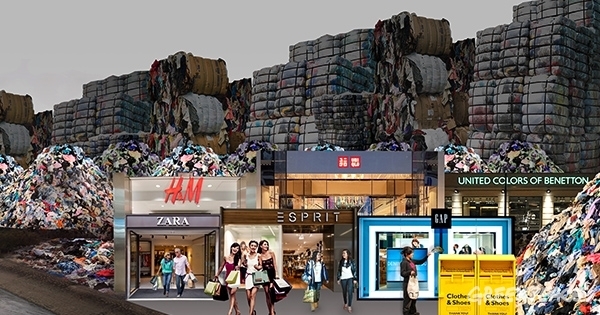 A recent report shows that Hong Kongers throw out the equivalent of 1400 t-shirts a minute. Today’s trends are tomorrow’s trash. We are told that clothes can be recycled, but second hand markets are already overloaded with our unwanted clothes. Greenpeace research found that up to date and comprehensive figures on clothes waste are not easily available. However, we do know that in the EU 1.5 to 2 million tonnes of used clothing is generated annually, with only 10 to 12 percent of the best quality clothes re-sold locally and much of the rest likely to be exported to countries in the Global south. Some countries in East Africa, which currently import used clothing from Europe and the US, are considering restrictions to protect their local markets. Due to rising volumes of cheap, low-quality fast fashion, the second hand clothing system is on the brink of collapse. Technical solutions such as closed-loop recycling – which would make new fibres from old clothes – is nowhere near possible. Although there is currently much interest from fashion brands and designers and a lot of promising research, none of the technologies are commercially viable at this point. This means that, as the situation stands today, every garment we buy will eventually end up as waste, to be burned in incinerators or dumped in a landfill. The only solution is to reduce our levels of consumption. It could be as simple as taking a break from shopping on Black Friday to participate in global “Buy Nothing Day”. This symbolic day invites people to stop shopping for a day and reflect on what they really need. 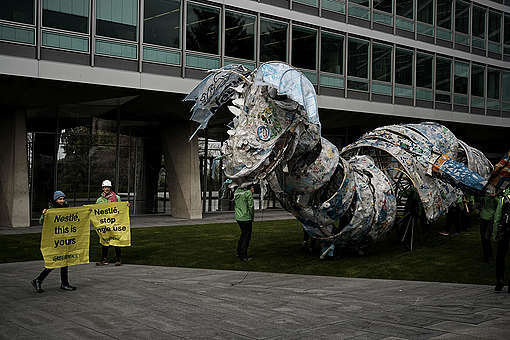 Greenpeace supports the message of “Buy Nothing Day” and is calling for “Time out for Fast Fashion”. It’s time to trash the throwaway-mentality and re-think what we really need in our wardrobes, instead of queueing up for the next cheap outfit. We can wear our clothes for longer, look after them, repair them, restyle and re-invent them, swap them with friends and pass them on. It’s time for fashion brands to re-invent themselves and design clothes that we really need and enjoy wearing – designed for better quality, longevity and for re-use. This is the only way to make fashion fit for the future. 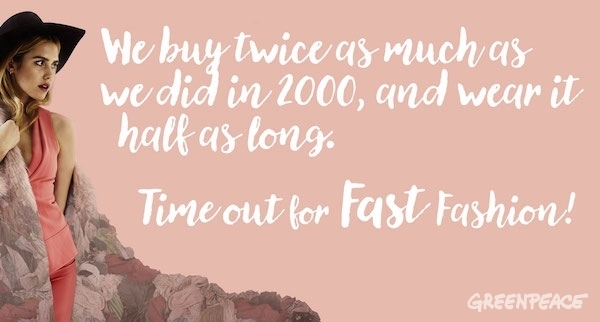 Let’s call timeout on fast fashion. I have a few tidy/smart clothes, which I wear when necessary. Smart but not high fashion!! Otherwise, I wear old clothes, in order not to spoil nice ones, and to wear them out. Old ones are mostly for gardening and doing household chores. Why dress up to do jobs like that?? P.S. Please don't send me lots of emails!!! in reply.